From Los Feliz Blvd. turn onto Crystal Springs Drive. 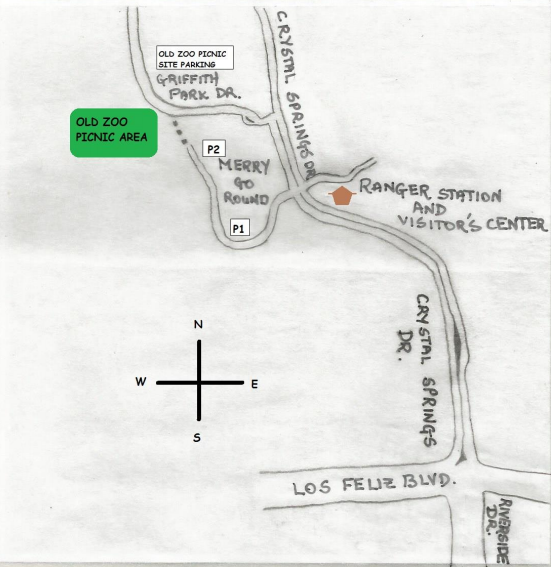 At the 4-way stop signs near the Ranger Station/Visitors Center make a left towards the merry-go-round. Drive past Parking lot 1 and park in parking lot 2. Drive past the 4-way stop signs near the Ranger Station/Visitors Center. Make a left at the first stop sign on to Griffith Park Dr.